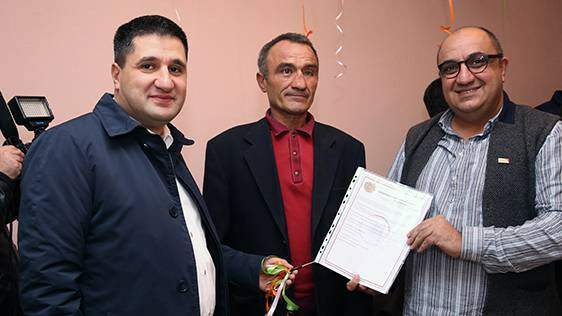 With the amount, donated by Ucom subscribers within the frames of “Let’s Keep Children in Families” charity program, implemented by joint efforts of Ucom Foundation and World Vision Armenia, a new house was bought and presented to the Karakhanyan family, living in one of the communities of Sisian urban region. 27 years later this family finally could have their own house, bought thanks to effective cooperation of Ucom and World Vision Armenia, and furnished with the support of the latter. It’s been already 1 year since the family was enrolled in “Poverty Reduction and Phase-by-phase Development” program initiated by World Vision, within the frames of which intense social works are carried out. The Karakhanyan family lived in extreme poverty, in the Category 4 hazardous building of the rural club. For around 7 years the father of the family has been looking after his 6 children without a wife. Lack of a woman has even more intensified poverty in this family. The family is facing a number of serious problems, among them unfavorable socioeconomic conditions, lack of elementary household skills, extreme sanitary and hygienic conditions of the dwelling and children. One of the girls of the family stays with a neighbor and sleeps at their home, other children as well spend most of their time with the neighbors and other acquaintances. “I’m just back from the army. Once we are in our new house, I’ll buy a bag of flour and make lavash for my brothers and sisters so that they are never hungry again,” resolved Artur, the elder son of the family. “Today, Ucom subscribers have done a good thing, by being part of this SMS-charity program. 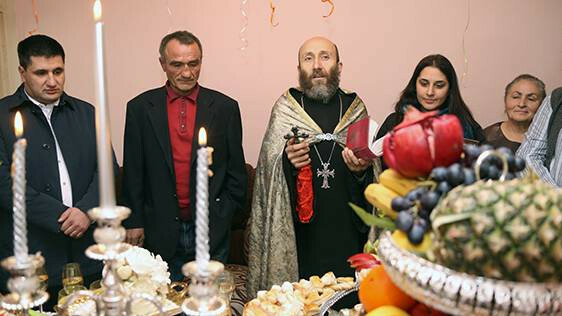 Thanks to the efforts of a thousands of good-hearted people, the Karakhanyan family will welcome the New Year in their warm and bright family atmosphere, of which they’ve dreamed their whole life,” said Hayk Yesayan, the Director General at Ucom. “When working with families living in extreme poverty, it’s important not only to focus on financial support of these families, but also help them develop independent living skills, for them to be able to live with dignity, without external intervention. World Vision will continue working with the Karakhanyan family, in order to achieve the desired result soon,” said Zhirayr Edilyan, the Program Director at World Vision Armenia. The program «Let's Keep Children in Families» implemented by the joint efforts of Ucom Foundation and World Vision Armenia, gives an opportunity to Ucom subscribers to donate 200 or 500 drams on a monthly basis by sending and SMS to 1234 or 5678 short numbers. By the end of the month Ucom Foundation doubles the amount collected during that particular month and redirects that to implement the project. Under the program the socially vulnerable families receive tools and equipment to ensure the stable source of their income and to have a possibility to bring up their children in their families. The summary results of the program show that thanks to this cooperation 66 children, of which many returned from care institutions, were kept in families throughout the past two years. Resources and tools have been provided to the socially disadvantaged families of these children, thus enabling them to have a stable income source and to raise and bring up children in a family.